We are a universe of possibilities waiting to be explored – quantum energetic beings. ﻿We are also conscious﻿ness itself, capable of altered states of being that bring divine wisdom and insight, so often forgotten in this human form. The Quantum Consciousness journey starts with the offering of what we call “The Remembering”, simply reminding us that we are so much more than we believe ourselves to be. This knowing changes the Present Consciousness and﻿ as we expand beyond time and space as we know it, through different states of awareness, healing and exploring aspects of ourselves in our personal universe. Our Stored Consciousness holds all the experiences in this lifetime at any age and we ask these aspects of ourselves to come forward to share wisdom or healing. We then travel through the realm of our Alternate Consciousness, where those important decisions created a replication of ourselves in an alternate reality. We meet and share time with these alternates who have much to offer us. Next we move through our Parallel Consciousness, where we are active in other bodies on this earth in another period of Earth’s history. Again there is that exchange that leaves all aspects of ourselves in a higher vibration. 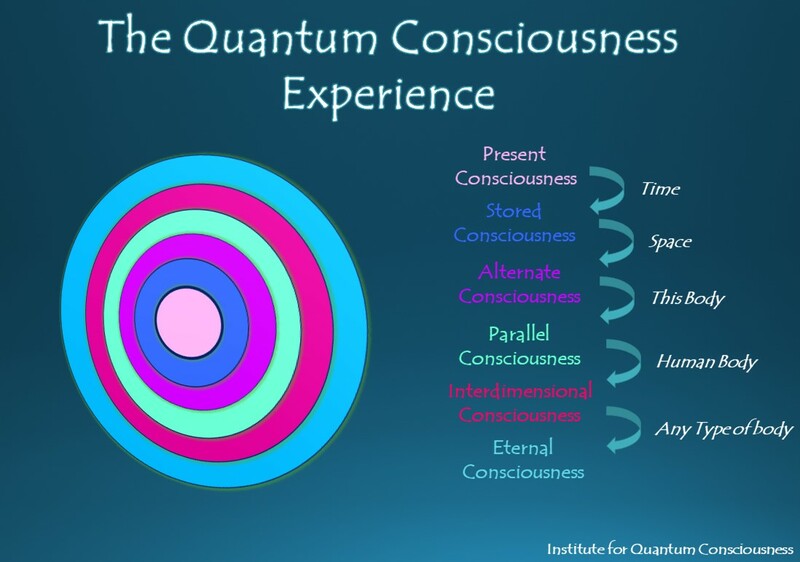 Next we visit our Interdimensional Consciousness where we experience the knowing of being in other life forms or dimensions again for that same exchange of energy. Finally we embrace our Eternal Consciousness and pause to experience that transformational energy before blending and resting in the "all there is."